A businessman at the Larchmont train station this morning was explaining the Stevenote phenomenon to his colleague. He was in awe that the events generate such hype and anticipation beforehand, then capture so much attention and dominate the news on keynote days. 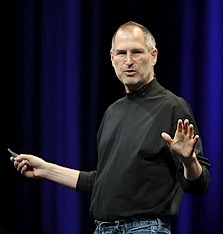 He suggested that Microsoft, Intel, Sony, and Dell could hold their own events like Apple’s to generate similar buzz. This is how a lot of the business world thinks, but it’s a terrible idea. People are passionate about Apple’s keynotes because they’re passionate about Apple’s products. We jump through hoops to set up and follow live chat transcripts — not because we want to see Steve’s outfit, but because we want more Apple products, and their pre-launch secrecy usually prevents us from discovering new releases until that moment. The entire Apple-hype ecosystem, from the rumor sites and forums to the keynote liveblogging, is fueled by the combination of secrecy and passionate users. Without either element, it couldn’t happen. But even if the other companies employed secrecy, they still couldn’t pull it off. Can you imagine these levels of passion and anticipation for any Dell product? Intel isn’t even a consumer-facing company, despite their marketing efforts to change that. Even if people got excited about a new CPU launch, what are they going to do? Buy a bare CPU as a desk ornament? Replace a 6-month-old computer to get 12% faster performance in one Photoshop filter? I’m sure Microsoft held Vista launch parties, but did anyone care? Did the attendees fantasize about going to a Microsoft launch party when they were teenagers? What about Sony? “Here’s another TV.” Groundbreaking. A product most people buy once per decade had an incremental improvement. Thinking Apple’s keynote success can be replicated is a typical MBA fallacy: drawing conclusions and making decisions in a vacuum.